Forty-eight men perished when fire swept a small, ancient hotel here today. Forty-four of them never got out of the three-story Gulf Hotel at Preston and Louisiana streets in midtown Houston. Justice of the Peace W. C. REGAN said evidence indicated that nearly all of the screaming, terrified victims trapped in the burning structure, were suffocated or asphyxiated before they were burned. They died fighting to get down the one fire escape not blocked off by the flames. Two died in hospitals. Thirty-two were injured and 16 of these were released after treatment. Some of the men were near death from their burns. It was Houston's worst fire and the costliest disaster in the state since the New London schoolhouse explosion which took 294 young lives March 18, 1937. The Gulf Hotel fire claimed 55 lives in the early-morning hours of September 7, 1943 in downtown Houston, Texas. This fire remains the worst loss of life in a fire in the city's history. The hotel was located on the northwest corner of Louisiana and Preston Streets and occupied the upper two floors of a three-story brick building, with a variety of businesses occupying the first floor. It was an inexpensive hotel near the city's bus depot, and reportedly had 87 beds, most divided from one another by thin wooden partitions plus 50 cots available for half the price of a bed. That night the guest log showed 133 names registered. Shortly after midnight, the desk clerk was alerted to a smouldering mattress in a room on the second floor. The clerk and a few guests thought they had extinguished the burning mattress and moved it to a closet in the second floor hall. Moments later, the mattress erupted in flames. The fire spread quickly through the second floor and headed toward the third. There were two exits from the hotel, both on the Preston side, one an interior stairs, and the other an exterior fire escape. The fire department's central station was located only a few blocks away at Preston and Caroline Streets. 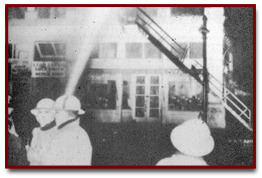 The alarm was received at 12:50 a.m. Deputy Chief Grover Cleveland Adams was the first to arrive at the burning hotel where he summoned a general alarm as he witnessed flames shooting from windows and the roof. Ted Felds of Harris County's Emergency Corps arrived about the same time and noticed many men on the fire escape, including a few on crutches, who were slowing the progress of others behind them still trying to escape. Two men died at the scene after jumping from the hotel's windows. There were 15 other fatalities in area hospitals. Firefighters recovered 38 bodies from the burned out building. In all, 55 persons died in the fire. More than 30 other persons were injured. A mass funeral was held for 23 victims of the fire who were never identified and they were buried at the South Park Cemetery in Houston. The hotel was fully occupied when the blaze began early on September 7, 1943. The fire spread rapidly because of the wooden partitions that created "rooms" in the old building. Firefighters arrived to find the front of the building already completely in flames. Hotel guests jammed the fire escape, blocking the exit. Some of the men tried jumping from the windows - two to their deaths. Firefighters battled the blaze for two hours before they were able to pull 38 bodies from the rubble. In all, the fire claimed 55 lives. Police homicide captain C.A. Martindale happened to be only three blocks from the hotel when the blaze broke out. When the captain pulled his car to the curb at the burning building, he saw a man making his way down the fire escape.